War Eagle. 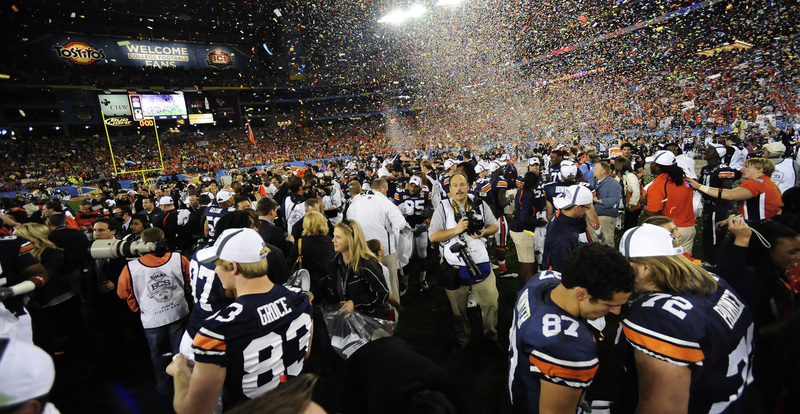 Auburn players and fans celebrate on the field after the game. On January 10, 2011, two undefeated teams met on the field at University of Phoenix Stadium in Glendale, Arizona, for the final game of the Bowl Championship Series. Two Sigma Nu brothers, one on each team, gave it their all in a match-up that would determine BCS National Champion. Emotions were high the night of the BCS Final as #42 tight-end David Paulson (Oregon) and #61 long-snapper Josh Harris (Auburn) took the field for the biggest game of the season. Whether or not you saw the game, you already know the Auburn Tigers achieved a 22-19 victory to win their first national title in more than 50 years. What you likely didn’t know is that both young men are members of Sigma Nu. Harris grew up with dreams of playing in the national championship. “To watch that game on TV every year, you just wish to one day get a chance to play in it, and to have that happen was really incredible,” he says. Of course his favorite moment was the chance to be part of the game-winning kick. “We practice those situations every day so we weren’t nervous. When Wes [Byrum, kicker], Neil [Caudle, holder] and I found out the game was going to be in our hands, we were excited because we knew we were going to come through and were about to win,” says Harris. If you really want to make a goal, you have to work for it every day. Set aside some time each day when you are going to do something to reach that goal, even if it’s small one day and bigger the next. While it was close there at the end, it was a disappointing loss for the Oregon Ducks. Paulson says playing in the biggest game of the year was an experience he’ll never forget. He talks about the opportunity to play college football for a coach like Chip Kelly who really cares about his players and wants them to do well on and off the field. “Our team really bought into Coach Kelly’s motto, ‘To win the day.’ You go out and compete every day in practice. Do the right things in the community. Do the right things in class. You’ve got to win every day; you can’t just take days off,” recounts Paulson, who certainly walks the talk with his strong academic focus, unassuming personality and the reputation of being an all-around good guy. 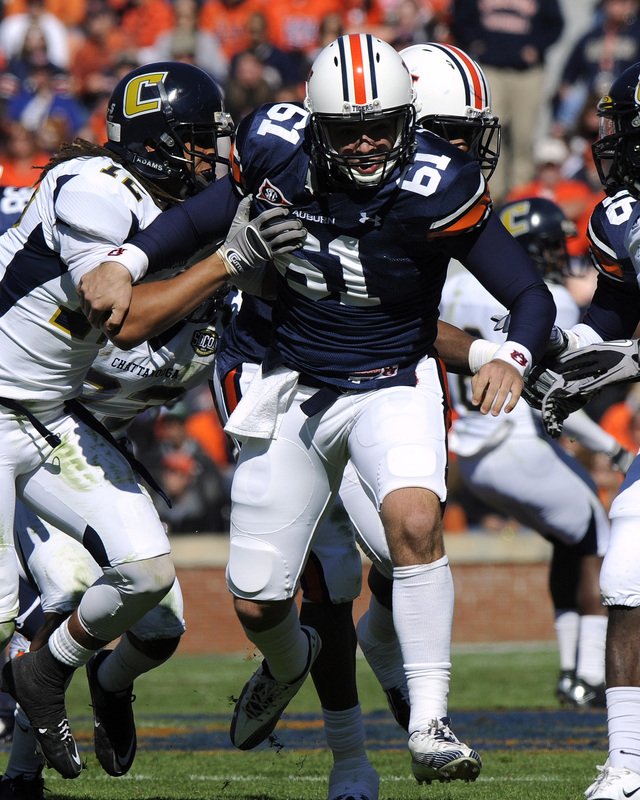 Josh Harris walked on when he came to Auburn in 2007. Paulson also appreciates Position Coach Tom Osborne, who seems to never have a bad day. “He always comes excited and ready to go to work. It has to rub off on you a little when the guy you see every day is always in a good mood and always trying to push you to do better,” he says. Harris offers similar thoughts about Auburn’s coach Gene Chizik. “He’s probably the best coach I’ve ever had. He’s very much a players’ coach. He knows how to communicate; he knows what he wants and we’re able to follow him because he’s a great leader. He also has extensive knowledge of the game that really shows through his coaching style,” he says. Based on their intense training and practice schedule, student-athletes might not always be the obvious candidates for fraternity membership. However, both Paulson and Harris put that idea to the test as they’ve been as active in their chapters as football has allowed, and their chapter brothers have also been extremely supportive of their involvement on the team. Harris walked-on when he came to Auburn in 2007. He didn’t think he would actually play football, so he decided to join Sigma Nu to get involved on campus. He ended up making the team and says he’s glad today that he didn’t walk away from the Fraternity. “I wasn’t going to give up on something I’d already started,” says Harris. If you don’t set high goals, there’s no way you’re going to achieve them. If you accept mediocrity, then there’s no way to achieve a higher level. It called for some flexibility in his fraternity commitments. The chapter was not only understanding but also excited for him. “They all thought it was the coolest thing that I’d even made the team. They weren’t mad that I was missing candidate activities, they just wanted me to be there as much as I could and really follow through with football because not everyone gets an opportunity to play college football, let alone at Auburn. They were very supportive,” he says. “Today my fraternity brothers are some of my closest friends. To be able to share an experience like this with good friends of mine is really special. It’s something I will cherish for a long time,” says Harris. Paulson joined Sigma Nu at Oregon during a re-colonization effort led by Expansion Consultant Andrew Meeks (Kent State). Meeks was looking for quality men to be part of reinstating the oldest Sigma Nu chapter in the Northwest. Even though Paulson had already made football a priority, Meeks says he was willing to also commit to the fraternity. “He came to as many things as possible. He got involved in the chapter and helped with alumni relations. He has a remarkable GPA, he’s an athlete, an academic All-American and he does what he can for everyone else,” says Meeks. Paulson says he joined because he wanted more than just the football experience at college. “It’s been great. I’ve made really good friends with some great guys in my Fraternity. I get to meet other people on campus, participate in different philanthropy events and get connected with the community in that way,” he says. Paulson says Sigma Nu chapters can do more to attract student-athletes to membership. “One obstacle is the stereotype of fraternities. But if you meet the athletes and get to know them, you can start to get past the stereotypes. After that, it’s easier to tell them what you’re really about and try to recruit them,” he says. It takes excellence to get to the national championship, and Harris and Paulson have learned plenty along the way. Both identified key aspects that made all the difference in creating a winning team: goal-setting, perseverance and teamwork. These same lessons easily translate to building a high-performing Sigma Nu chapter. “Football is the biggest team sport there is. There are no individuals on a football team. The team is one body. One person might be able to change an outcome here or there, but the bottom line is, if the team doesn’t perform well overall, you’re not going to win,” Harris explains. The same goes for a Sigma Nu chapter. Work hard as a team, and there’s not much you can’t accomplish. “Plus, the more time you spend together the closer you become and teamwork becomes more like friendship,” he says. For chapters seeking to achieve excellence like the Rock Award, Paulson offers what he’s learned through practice and perseverance in football—every day counts. “If you really want to make a goal, you have to work for it every day. Set aside some time each day when you are going to do something to reach that goal, even if it’s small one day and bigger the next. Don’t try to take days off and make up for it later. You really have to take one day at a time and think about what you can do today to help out your chapter,” he says. On top of that, everyone has to buy in to the mission. “That’s why we were successful this year; everyone was buying in to our team goals. We’re here for each other and working towards the same goal,” says Paulson. “One thing I’ve learned is, never sell yourself short,” says Harris, about how to win on the football field as well as achieve greatness as a Sigma Nu chapter. “If you don’t set high goals, there’s no way you’re going to achieve them. If you accept mediocrity, then there’s no way to achieve a higher level. After not going to a bowl game at all two years ago, I would have never thought in a million years that we’d be winning a national championship, but we did because we set goals, worked hard and stayed persistent to reach our goals,” he says. Harris will finish up his political science degree in December with hopes to go to law school after that. While it’s too soon to know where, it’ll certainly be tough for any school to compete with the culture he’s found and come to love at Auburn University. Though he’s thankful to have had a role in the tremendous 2010 season, Harris recognizes that the Auburn tradition is so much bigger than just one season. “I feel like the Auburn family deserved that win. They’re the most dedicated and loyal fans in the country. Everyone who plays for Auburn understands that and knows it’s pretty much up to each individual to uphold the Auburn name and tradition. It’s really something special that Auburn has here; it’s unlike anything I’ve seen,” he says. Paulson will finish up his degree this year, but he has one more year of eligibility left; he’ll make the most of it since he’s been accepted to Oregon’s accelerated MBA program. He credits Sigma Nu with teaching him how to handle himself in a business environment, which will come in handy as he plans to seek a career in sports marketing, sports sponsorship or work for a sports franchise following graduate school. But who knows the timing of that. There are murmurings that there may be a spot in the NFL for this exceptional tight-end. 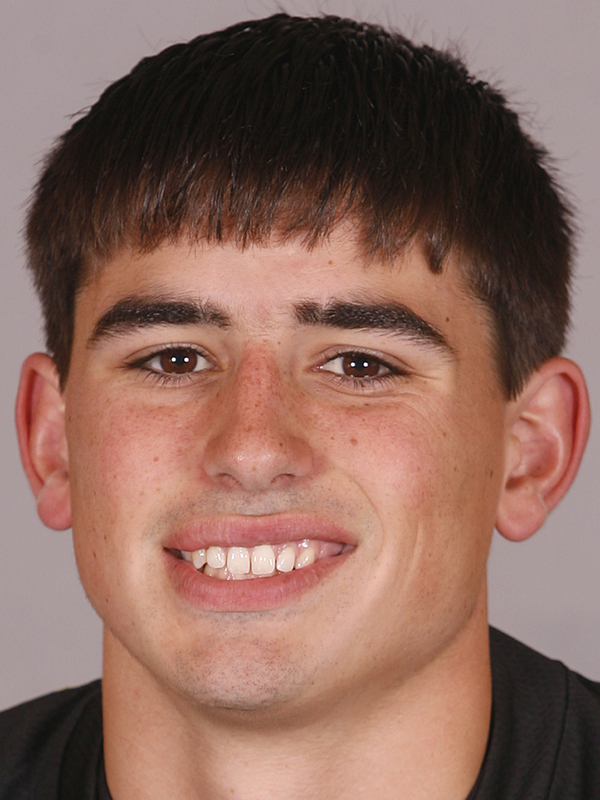 Oregon tight end David Paulson had several third-and-long clutch catches for the Oregon Ducks during the National Championship game. With one year of eligibility remaining, David plans to pursue his MBA during next year’s season.